Croeso i Fythynnod Llanilid. Welcome to Llanilid Cottages. 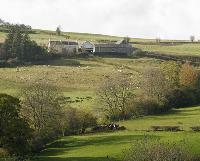 Llanilid Holiday Cottages lie at the heart of our 220 acre organic farm. In 2005, we transformed these 4 and 5 star self-catering holiday cottages from a range of 18th century barns, blending tradition with contemporary to create a unique holiday experience- a real escape from the rat race. We have spectacular views; over the Crai Valley and across the undiscovered western area of the Brecon Beacons National Park, Mid Wales. There's no such thing as the 24 hour day here! You'll notice the breathtaking dark skies and absence of light pollution. Wrap up warm, pack a blanket and picnic and look up at the stars! Summed up by one of our recent guests " An ideal place to relax and unwind... never to be forgotten al fresco breakfasts with the sheep in the background... finished off perfectly with the display of shooting stars on the last night..."
At Llanilid Holiday Cottages you have the perfect base for your activity packed holiday or stress free mini-break in the Brecon Beacons, Mid Wales. Llanilid Holiday Cottages lie within a 15 minute reach of traditional Mid Wales market towns such as Brecon and Llandovery. Take a day trip to the cosmopolitan capital city of Cardiff or the coast. The beaches of the Gower and the Pembrokeshire National Park lie within easy reach. The Brecon Beacons National Park and Mid Wales offer superb outdoor activities including walking, cycling, fishing and horse riding. To set the adrenaline racing, try one of the nearby multi- activity centres. The Brecon Beacons National Park is a treasure trove for Geocashing enthusiasts and the bird watching is second to none. Walk freely on our farmland and enjoy watching life on our organic family farm. Enjoy unforgettable away days at some of Mid Wales' award winning visitor attractions offering all weather entertainment. Weekly prices normally range from £235 - £600 and short breaks from £190- £330. Changeover is normally a Saturday, although we want to be as flexible as possible and will try to meet other requests if given advanced notice. We ask you to arrive after 3pm and to vacate by 10am. At certain times of the year, we can negotiate longer lettings. The name "Llanilid" means the land belonging to the church of St. Ilid. These 4 and 5 star cottages lie on our organic farm which stands on a site dating back to Roman Times - a standing stone, marking a Centurian's tomb was found among the ruins of the church. This is now in the British Museum, with copies in nearby Llywel Church and Brecon Museum. We have refurbished Llanilid Holiday Cottages to blend a sense of history with 21st century comforts; using original Welsh slate, oak beams and flooring, neutral colours and natural materials to create clean, uncluttered lines. All cottages have central heating, well-equipped modern kitchens, bathrooms and laundry facilities. Fluffy white towels are provided and the beds made up with 100% cotton sheets and duvets. Cot, highchair, stair gates and baby bath are also available on request. Each cottage has its own lockable storage shed/drying room containing a barbecue and garden chairs for al fresco dining. There is also an outside tap, located in the car park, for washing down bikes, boots, etc. There is good mobile telephone reception and ample off road parking. Recycling bins are provided on site. Wander through the farmland that surrounds Llanilid Cottages and watch the seasonal on-farm activities. Enjoy lazy afternoon picnics or evening barbecues at the secluded river and stream side locations on your doorstep. Feel free to feed the hens who you'll see roaming freely on the farm. Try their free range organic eggs and pick the seasonal hedgerow blackberries, nuts and wild mushrooms. You can buy our own naturally produced organic lamb from the award winning Graig Farm . Alternatively, Crai Valley Produce offer a variety of hampers, full of locally produced wholesome food and drink, direct from fields, not a factory. 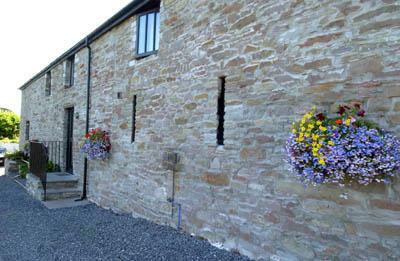 Order them online and have delivery free of charge to Llanilid Cottages before your arrival.